... not because I don't like you, but because I might not be able to get them done. Mark was in town for about two weeks. … And we got NO wedding stuff done. Oh, wait. Actually Mark was sick for about four days, so I was able to corner him on the couch one night and make him listen to the list of first dance songs I compiled. And we chose his ring, but have yet to order it. Mark doesn't know his ring size and his idea of sizing a ring means taking off the ring that he usually wears on his middle finger and placing it on his ring finger. “Smaller than this,” he says twirling the too-big ring around his finger. “Okay. Well what size is that one?” I ask. “I’m not sure.” I stare at him blankly. “I’ll just go to a jeweler and get it sized,” he says. However, I know Mark. And going to the jeweler won’t happen. Not because it’s his fault, but between driving back and forth from Miami to Fort Lauderdale on his jet-pack of a motorcycle, dealing with the boat issues, contractors and the boss, on top of trying to plan the trip to Croatia, stopping by a jeweler was at the bottom of his list. Once Mark left for his month-long charter in Croatia, and my wedding honey-do list was left unfulfilled, my mom came into town. 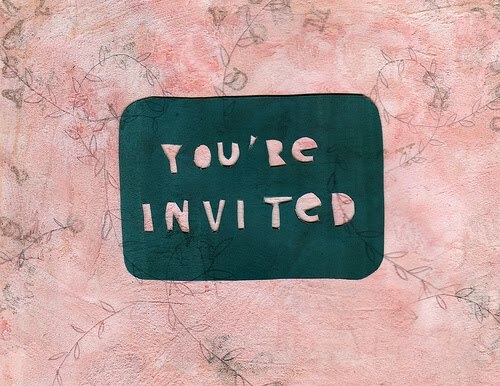 Now, I decided to do my own invitations. Why? Well at the time I was still in Cincinnati with my mom and grandma at the kitchen table, hole punching, stuffing and stamping save-the-dates. I also have three brothers, a dad and local bridesmaids. I figured with all this slave labor getting 170 invites done will be a fun, pizza and beer-filled afternoon with the fam. Since that decision, I quit my job, moved on a boat for three months, finished that job and moved to Miami to start an intense three-year Oriental Medicine Master’s program. The invitations were set aside. I finally was able to design some, bought the paper and forwarded the design to my mom for a final spell check, only to have her write back that she totally hated them (they weren’t formal enough). I know some of you reading this will say, “So what? It’s your wedding.” But as any girl knows, most girls look to their mothers for approval, no matter how strain the relationship is. I hadn’t allocated a budget for professional invites, and even though my parents agreed to pay for professional invitations, there was something about spending over $1,000 on a piece a paper that I had issues with. So I was back to the drawing board, and succeeded with a mom-approved invite. And now here I sit with boxes of cardstock and paper cutters in front of me. Mom my promised to help me when she came to visit, but between a final exams, beach trips and fireworks, there was no time. It’s now nearly 6 p.m., 75 days before the wedding and I am in invitation hell! Elopement is sounding like a really good idea right now. Not only would I save paper and money, I’d save much more time just updating my Facebook page with a “Tara is now married” than tying ribbons on all this RSVP cards. hey girl! i'll come help you next week when im back if you don't blow thru them this week. Oh Tara, I wish I was there with you now. 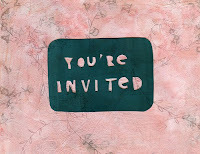 As I have some free time I'd be able to work on those invitations and hopefully save you a headache. Then we'd go to the beach of course. Hang in there. It's all going to be wonderful!